The Giants lost their third straight game today, which resulted in the Diamondbacks’ sweep of the three-game series during MLB’s opening weekend. Thankfully, the first three games of a 162-game season aren’t too significant, but the Giants must be somewhat concerned that they were swept by their biggest NL West rival. 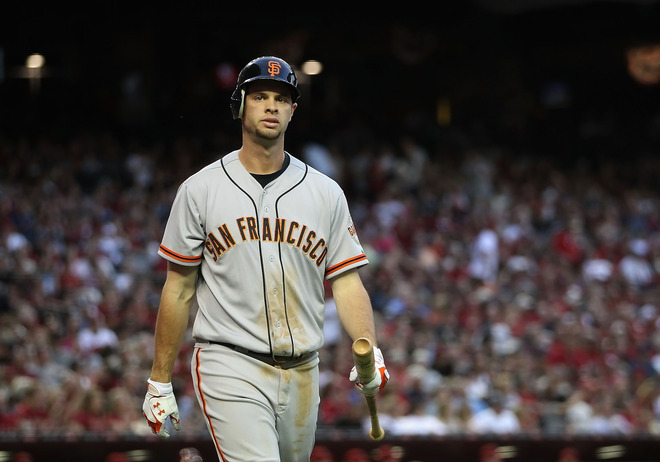 Surprisingly, fans witnessed a lot of positive elements of this 2012 Giants team in this past series, but, unfortunately, they also witnessed some aspects that need to be improved immediately. This starting lineup will most likely be the regular lineup for the rest of the season. This particular Giants team is supposed to feature stronger offense and more youth, which it does. If Burriss had started in Theriot’s place, the Giants would have featured their first all-homegrown Opening Day infield since 1993, which would have been fun to see. Regardless, Giants’ management has clearly made a stronger effort to be more committed to the younger players in this organization, which is an impressive step. In addition to this new committment, the Giants were able to score 14 runs in these three games, which is definitely an improvement since last season. The offense this season features more speed with Pagan, Cabrera, and Blanco, and this offense generally appears stronger through all eight spots (excluding the pitcher’s spot). Also, the fact that Buster Posey was able to catch all three games with no pain is a great sign for all Giants fans and a definite sigh of relief of some sorts. The Giants showed some areas of concern in this series though. First of all, they committed six errors during the series (three on Friday and three on Sunday). Posey looks a little rusty behind the plate and has committed three errors. 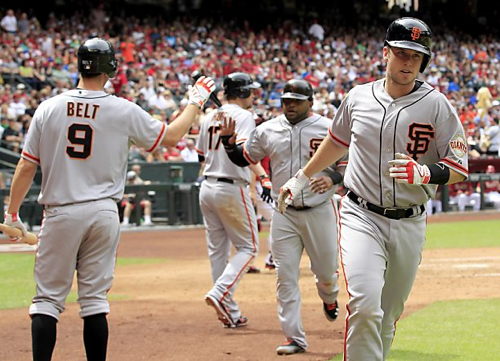 Posey hasn’t caught a full game in almost a year, so a couple missteps is to be expected. Brandon Crawford made this team because of his defensive prowess at the shortstop position, however, he has committed two errors on fairly routine groundballs and during important situations where outs were severely needed. Crawford is most likely nervous to be starting consistently now, so his confidence will hopefully come back soon. Secondly, the Giants have a very left-handed heavy lineup. Against right-handed pitching, this is obviously not a very significant issue, but the Giants are bound to experience problems once they face more consistent left-handed pitching. After scoring six runs on Josh Collmenter (a right-handed pitcher), D-backs manager Kirk Gibson put in reliever Wade Miley (a left-handed pitcher) for four innings, and that’s when the Giants offense was completely shut down for the rest of the game. Bruce Bochy might have to consider starting Brett Pill more just to have more of a right-handed hitting presence. Lastly, the Giants have to improve upon their batting average with runners in scoring position, which was one of their biggest problems last season. So far this season, the Giants are batting .167 with runners in scoring position and .125 with two outs and runners in scoring position. Last season, the Giants batted .219 with runners in scoring position and .173 with two outs and runners in scoring position. Even if the Giants offense is more well-rounded than last season, clutch hitting has to become a priority to everyone, because if not, the Giants won’t accomplish much this season. Excellent pitching can only carry a team so far, as we saw last season. This past series didn’t exactly display superior pitching either. It is very early in the season, so fans shouldn’t be too concerned about pitching yet. However, Tim Lincecum continued his poor spring training performances into the first game and Madison Bumgarner looked frazzled in his start. Matt Cain pitched fairly well in the series finale besides a few poor pitching sequences. Lincecum will find a way out of his slump, because he always does. Once he gets into his usual rhythm, Lincecum will hopefully remain reliable throughout the rest of the season. Bumgarner didn’t do well at the beginning of last season, so hopefully his poor performance during this series is because he hasn’t settled into his regular form yet. Last season, Bumgarner had a 6.17 ERA in the month of April. In May of last season though, Bumgarner had a 2.21 ERA. Bumgarner is still very young, so hopefully he will settle down soon and get back to his dominant pitching. Giants’ fans don’t need to worry, yet. The D-backs are an extremely talented team with powerful hitting and they have one of the best pitchers in baseball right now, Ian Kennedy, so this is not a total disaster that they lost this series. 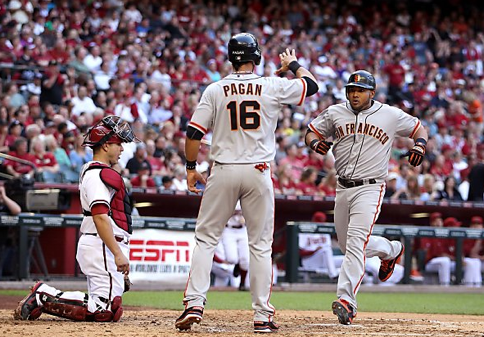 The Giants will face the D-backs in six more series this year, so there is ample time for recovery and revenge. The Giants face the Rockies in their next series, so hopefully they can start to find consistent hitting and pitching.